You can use a conventional popover pan or regular muffin tins (although the muffin tin ones will be smaller and shorter). Makes 6 large popovers or 10 muffin-tin-sized popovers. It's important that your milk and eggs be at room temperature, so be sure to let sit on the counter for about 30 minutes before mixing the batter. Preheat oven to 450° F. with oven rack in the lower third of the oven (an no rack too close above it). Place popover pan (or muffin tins) in oven to heat while you mix the batter. In a large bowl (preferably one with a spout for easy pouring), combine the eggs and milk in a large bowl and whisk vigorously until the mixture is very frothy, about 1 minute. Add the flour, salt and pepper and whisk until batter is the consistency of heavy cream with some small lumps and air bubbles remaining. Remove popover pan from oven and coat lightly with cooking spray. Fill popover cups about half full with batter. 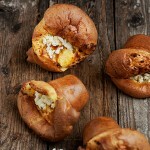 Drop a large chunk of goat cheese into the centre of the batter in each cup. Bake bake for 20 minutes, then reduce temperature to 350° F. and continue baking until golden brown, about 18-20 minutes more. Remove the popover pan from the oven and immediately turn them out onto a wire rack. Using a sharp knife, poke a small opening in the side of each popover to let the steam escape. Serve immediately.